Aside from the results that we've already reported on here at SaddoBoxing, there was good action across the globe and we start at The Casino in Montreal, Canada where two important prospects were in action. 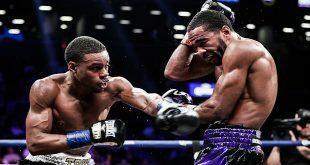 Welterweight Antonin Decarie, 18-0 (5), dominated former IBF Lightweight title challenger Israel Cardona, 36-9 (28), by a wide points decision after ten rounds while featherweight Olivier Lontchi, 15-0 (6), had a more difficult challenge, posting a hard fought unanimous decision over Henry Arjona, 17-10-1 (11). 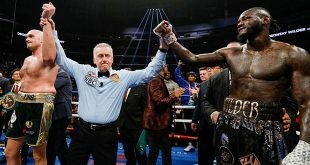 Onto America, where at the Park Theater in Union City, NJ, welterweight Henry Crawford, 18-0 (8), stayed perfect with an eight round unanimous decision over Thomas Davis, 12-7-2 (7) and at the Aquarius Hotel in Laughlin, NV, heavyweight Devin Vargas, 15-0 (6), outpointed Charles Davis, 17-15-1 (4), over eight rounds. At the Civic Auditorium in La Porte, IN, light heavyweights Nick Cook, 15-1-2 (9), and Marcus Oliveira, 12-0-1 (9), fought to a draw after ten rounds while lightweight Don Moore, 15-0-1 (10), posted a six round decision over Randy Dodds, 6-23 (3). Heading over to Europe, at Hala Globus in Lublin, Poland, former IBF Cruiserweight Champ Krzysztof Wlodarczyk, 40-2 (30), stopped Gabor Halasz, 20-11 (8), in four. On the undercard, light heavy Dawid Kostecki, 27-1 (19), decisioned Armen Azizian, 8-5-0 (1), over eight and WBC Youth Cruiserweight titlist Pawel Kolodziej, 20-0 (12), retained his belt with a seventh round knockout over Laszlo Hubert, 8-1 (5). Popping over to Estadio Rayo Vallecano in Madrid, Spain, ex-European Lightweight Champion Juan Carlos Diaz Melero, 35-1 (19), crushed Cristian Hodorogea, 11-13-0 (5), in a single round. Also on the bill, light welter Joso Soto, 22-4-2 (11), posted a six round decision over Ionut Trandafir Ilie, 9-2-1 (1). Going north into Denmark, the Mediecentret in Aabybro saw former European Cruiserweight title challenger Lasse Johansen, 15-1 (11), starch Viktor Szalai, 5-8-1 (2), in two rounds while lightweight Sam Runkundo, 12-0-1 (5), stopped Alexander Saltykov, 5-8-2 (3), in four. After a long flight over the Atlantic, we hit sunny Leon, Mexico where at Domo De La Feria, WBC Light Flyweight Champion Edgar Sosa, 31-5 (16), retained his crown by posting a unanimous decision against challenger Jesus Iribe, 13-5-3 (7). 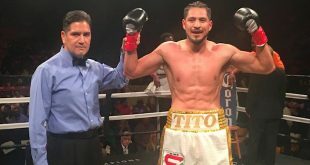 The undercard was stocked with good fights as big punching middleweight Marco Antonio Rubio, 41-4-1 (36), brought the dynamite and stopped Jose Luis Zertuche, 19-5-2 (14), in the seventh, light middle prospect Julio Cesar Chavez Jr, 35-0-1 (28), finished off Jose Celaya, 31-4 (16), in the eighth round and NABF Super Bantam boss Bernabe Concepcion decisioned challenger Juan Ruiz, 21-5 (6), over twelve rounds. Former WBO Heavyweight Champ Tommy Morrison, 48-3-1 (42), continued his comeback by derailing Matt Weishaar, 3-1-2 (2), in three. We finish up this week's Saturday report with a trip to the Mindanao Civic Center in Tubod, Philippines where minimumweights Denver Cuello, 13-2-5 (6), and Arman Dela Cruz, 19-11-3 (7), had their fight stopped in the third due to a technical decision and the contest was declared a draw. Also on the card, super bantam Cisco Morales, 10-0 (6), decisioned Marangin Marbun, 11-4 (5), after ten rounds to annex the vacant WBO Oriental and Asia Pacific titles.